School Boards in Knoxville, Chattanooga, and Memphis have all voted to begin the process of exploring a lawsuit challenging the adequacy of the state’s school funding formula, the BEP. This challenge is different from the previous Small Schools challenges in two ways. First, it is being initiated by the large school systems, with some support from smaller districts. Second, it’s about adequacy, not equity. That is to say: The point of this potential lawsuit would be to say Tennessee’s school funding formula does not provide enough funding for ALL districts. Past suits, focused on equity, argued that smaller and poorer districts lost out because the formula didn’t give kids from all districts an equal opportunity. There’s certainly evidence that the BEP is approaching (or already at) unacceptable levels of inequity. One noteworthy example is teacher pay, which shows a disparity of 42% between the top paying and lowest paying districts. The last Small Schools suit found a disparity of 45% unconstitutional. It’s not at all a stretch to suggest that 42% is also unconstitutional or that Tennessee will very soon be at the 45% disparity level. This time, though, systems are suggesting that overall funding for schools needs to increase — likely to the tune of $500 million or more. …In Hamilton County, the school district funds teaching positions, maintains building and pays utility bills. But for other costs of running a school — including copiers, phone bills and school supplies — the schools have their own budgets, which often don’t come close to covering annual expenses. That’s why money from school fees, vending machines and fundraisers is so important. Yes, that’s right. Schools are counting on money from selling unhealthy snacks to teenagers to meet their budgets. Existing funds aren’t enough to pay the phone bill or provide adequate school supplies. The problem with the BEP now goes beyond equity — the inputs simply aren’t adequate to meet the needs of Tennessee’s public schools. Governor Bill Haslam delivered his State of the State address tonight and outlined his budget and policy priorities for the coming year. Among the proposals he outlined was $100 million to provide raises for Tennessee teachers. That equates to enough money to provide all teachers with a 4% raise. Haslam’s plan doesn’t increase teacher compensation by 4%. Instead, it provides the money to districts and encourages them to use it to reward the “best performers.” Districts could give all teachers 4% or they could provide 6% raises for some teachers and 2% raises for others. Or they could, as they did the last time an increase in salary money was provided, give a smaller raise to more instructional staff. In 2013-14, Haslam provided funds for a 1.5% raise but the average Tennessee teacher saw only .5% — or 1/3 of what was available. Districts used the remaining funds to cover other instructional costs. Let me be clear: Haslam is to be commended for finding the resources to provide districts with these funds. $100 million for a teacher pay increase is the biggest pot of money for that purpose to be provided in many years. Additionally, Haslam is dealing with revenue issues by proposing a modernization of the tax code. It’s plan that will introduce fairness and protect small, Tennessee-based businesses. But it’s not a 4% raise for all teachers. Not yet. And Tennessee teachers are facing growing pay inequity and overall pay that lags the rest of the country. Adding 4% to all teacher salaries, by, for example, increasing the BEP instructional component, could go a long way toward making Tennessee the fastest-improving state in the nation in teacher pay. Haslam’s proposal is an important first step down that path. With some help from the General Assembly, Tennessee could make Haslam’s 2013 promise on pay a reality. That’s the question the Tennessee Education Association is asking about the use of value-added data (TVAAS) in teacher evaluations. 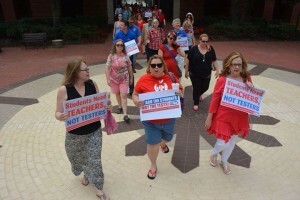 The TEA, joining with the National Education Association, has filed a lawsuit challenging the constitutionality of Tennessee’s use of TVAAS data in teacher evaluations. According to a press release, TEA is specifically concerned about teachers who receive value-added scores based on students they have never taught. A significant number of Tennessee teachers currently receive a portion of their evaluation score based on TVAAS scores from school-wide or other data, meaning teachers are graded based on students they’ve never taught. More than half of the public school teachers in Tennessee receive evaluations that are based substantially on standardized test scores of students in subjects they do not teach. The lawsuit seeks relief for those teachers from the arbitrary and irrational practice of measuring their effectiveness with statistical estimates based on standardized test scores from students they do not teach and may have never met. While Governor Haslam is proposing that the legislature reduce the impact of TVAAS scores on teacher evaluations during the state’s transition to new standardized tests, his proposal does not address the issues of statistical validity with the transition. There is no way to determine how TCAP scores will interface with the scores from a test that has not even been developed yet. To hold teachers accountable for data generated in such an unreliable fashion is not only statistically suspect, it’s disrespectful. Finally, it’s worth noting that value-added data doesn’t do much in terms of differentiating teacher performance. Of course, even if it did, holding teachers accountable for students they don’t teach defies logic. Over at Bluff City Ed, there’s an article analyzing the new pay scale for teachers in Shelby County Schools. The scale is weighted toward TVAAS data and the evaluation rubric, which rates teachers on a scale of 1-5, 1 being significantly below expectations and 5 being significantly above. A teacher earning a 3 “meets expectations.” That means they are doing their job and doing it well. Jon does a nice job of breaking down what it means to “meet expectations.” But, here’s the problem he’s highlighting: Teachers who meet expectations in the new system would see a reduction in their annual step raise. That’s right: They do their job and meet the district’s performance expectations and yet earn LESS than they would with the current pay system. But what the district outlines as meeting expectations exemplifies a hardworking and effective educator who is making real progress with their community, school and students. If a teacher is doing all these things, I believe that they should be in line for a yearly raise, not a cut. At its core, this new merit pay system devalues our teachers who fulfill their professional duties in every conceivable way. I would add to this argument that to the extent that the new pay scale is based on a flawed TVAAS system which provides minimal differentiation among teachers, it is also flawed. Value-added data does not reveal much about the differences in teacher performance. As such, this data shouldn’t weigh heavily (or at all) in performance pay schemes. Systems like Shelby County may be better served by a pay scale that starts teachers at a high salary and rewards them well over time. Increasing pay overall creates the type of economic incentives that both attract strong teachers and encourage school systems to develop talent and counsel out low performers. Shelby County can certainly do more to attract and retain strong teaching talent. But the new pay scale is the wrong way to achieve that goal. Lauren Hopson, whose remarks at a Knox County School Board meeting gained national attention, is seeking the Presidency of the Knox County Education Association. Hopson is joined in campaigning by Amy Cate, who is seeking the Vice Presidency, and Linda Holtzclaw, running for Secretary. Hopson’s speech was the catalyst for a movement that become SPEAK: Students, Parents, and Educators Across Knox County. The group speaks out on education issues and even recruited and supported some successful candidates in the recent school board election. Hopson sought to draw attention to Knox County Schools policies that she believed harmed both teachers and their students. Now, SPEAK keeps Knox County citizens informed of relevant education issues and regularly engages local policymakers in discussions about how to improve Knox County Schools. Recently, I wrote about the Tennessee Comprehensive Assessment of Poverty, or TCAP. In that piece, I talked about how concentrated poverty combined with low investment in schools led to poor educational outcomes. I also mentioned how the broken BEP impacts districts because it is inadequate to meet the needs of Tennessee’s schools. Now, I want to share the data I used to make those claims. This data will show % of investment above BEP requirements, 3 year average ACT score (where applicable) and average TCAP scores. District % above BEP 3 yr ACT avg. TCAP avg. The Top 10 districts in terms of student achievement invested nearly 28% above the BEP requirements and had an ACT average well above the state average. District % above BEP 3 yr. ACT avg. TCAP avg. The bottom ten districts in terms of student performance invest less than 10% above the BEP formula and have an ACT average well below the state average. Interestingly, even the bottom 10 districts spend just over 9% more than the BEP formula on average. That’s a sure sign that districts can’t run on the funds and funding levels established by the current BEP. The BEP is simply inadequate to meet Tennessee’s educational needs.